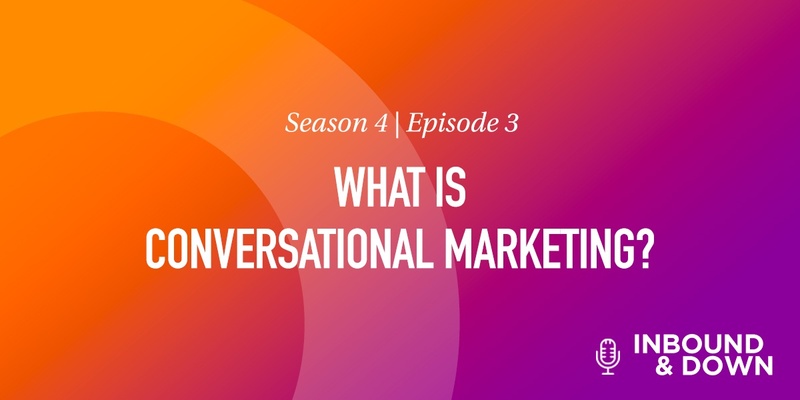 'Inbound & Down' S04 E03: What Is Conversational Marketing? On this episode of 'Inbound & Down,' co-hosts Jon Sasala and Danielle Esposito are joined by special guests and Morey Creative team members Jeff Main and DellaB to discuss conversational marketing, and what it means for your business. If this was Inbound Jeopardy and you answered with "What is the ability to have one-to-one personal conversations across multiple channels–meeting customers how, when, and where they want?" then you'd have some nice cash, and probably a photographic memory. Conversational marketing means being more conversational with our clients and users. Don't answer every client question in Jeopardy cadence, though, speak the way you would normally speak. For example, use a contraction in favor of its formal counterpart–ie. haven't vs. have not. This makes you sound more personable, and human. Try not to confuse conversational for informal, however. U dnt wnt 2 tlk 2 cstmrs lik ths. A lot of conversational marketing revolves around the advent of live chat, because, what's more conversational than having a conversation, in real time? There are many paid chat services you can utilize for your website...but guess what's better than paid? F R E E! HubSpot has launched their chat tool Conversations, to the world, for free. When setting up your chatbot, consider your buyer personas. What types of questions will they ask? How will they communicate? By considering your personas before the chat is initiated, you're setting up a considerate and helpful experience for them. Another way to be considerate is by being thoughtful about where you place your chatbot. It's probably not appropriate to have a bot pop up on every page. Place them strategically throughout your site, where a visitor would gain the most value from there presence. Bot strategy isn't something that's quick and easy. It takes time and consideration of your company, personas, customers, and history. It's worthwhile and ultimately necessary though, as the ~future~ is right around the corner, and the future of sales and marketing is a happy customer. Conversational marketing is chat-based, one-to-one interactions, meeting the customer where they want to be met, in whatever channel they want. If you have the free HubSpot platform, you have the free Conversations tool ready to implement. Anticipate what customers are going to ask your bot, and train it to answer thoughtfully. Keep it simple. Don't overcomplicate the process, and be considerate of your users. 3 Conversational Marketing Campaigns That Generate More Qualified Inbound "Leads"